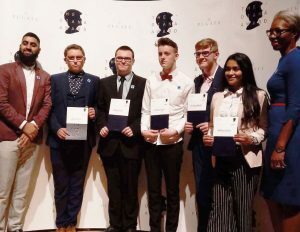 Andrew Hill, Saff Sergeant in 7th Grimsby Company is the proud recipient of a Diana Award after becoming involved in Youth Action group as part of the volunteering aspect of his Queen Badge journey. He was put forward for the award for the excellent work his group initiated around mental health and challenging the stigma within his local area. The group made and commissioned a set of films on YouTube called Mental Health mixtape. The films were made following a consultation on service providers across different events and the results of those were passed on to group who, supported the opening of an online counselling service, and mental health youth forum. Andrew personally lead the section on Mental Health First Aid. Andrew said “After being trained myself I advocated the idea to my school/sixth form to run a pilot scheme to train young people in schools as Mental Health First Aiders. The scheme is currently being adapted to roll it out to all schools in the area, so as you imagine I am extremely proud”. Find out more about the award at diana-award.org.uk.